John, the top performer at the Intermediate High School (IHS), told SEARCHLIGHT that she was happy about receiving her results. John wrote nine subjects and gained passes in seven. She received grade threes in Social Studies, English A, Principles of Business, Office Administration, Electronic Document Preparation Management, History and Science. She, however, expressed her determination to re-sit those subjects that she did not pass. âDefinitely, Iâm gonna do them over!â she said, of her Maths and Principles of Accounts examinations. Though stating that she felt good about her performance, John admitted that she wanted to do better. The Lodge Village resident, however, does not wish to change anything about the way she prepared for her examination, stating that she worked very hard and also helped out classmates. ââ¦but I accept what I got,â she stated, adding that her mother Claire John, also of Lodge Village, was also elated about her success. 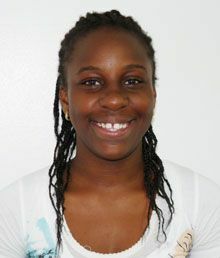 John intends to continue her education at the SVG Community College, with a focus on Business Studies. She also intends to extend her education to the university level. John expressed thanks to her many classmates and her family members who were the driving force, encouraging her throughout the study process and examinations, and to God, for giving her the strength to go through each examination. According to a Ministry of Education release, the Intermediate High School returned the most improved results when compared with 2010. This year, they have a pass rate of 55 per cent, up from 34 per cent in 2010. The school entered 29 candidates for the exam, with 14 students gaining passes in four to seven subjects.